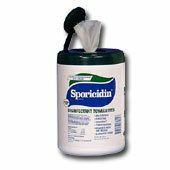 Pop-up canister of 5" x 8" Disinfectant Towelettes. 180 towelettes per canister. Fresh scent. The towelettes are presoaked with Disinfectant Solution. It is EPA Registered. Bactericidal, Virucidal, Fungicidal - kills mold and mildew and inhibits re-growth for up to 6 months. An effective Cleaner, Disinfectant and Deodorizer for residential, food processing and institutional applications.